The tinkering began in garages in San Diego and Israel in 2005. The goal? Make one of civilization’s most valued workhorses – the internal combustion engine – vastly more efficient. Company co-founders Dr. Oded Tour and his father Hugo Tour, former head of the IAF’s (Israeli Air Force’s) Mechanical Labs, had a keen insight about internal combustion engines (ICEs): knowing that ICEs lose about 37% of their energy to cooling, and another 27% to exhaust, the father and son duo decided to “split” the conventional engine cycle into two distinct “hot and cold” halves. In true entrepreneurial fashion, their first effort essentially “siamesed together” two lawnmower engines. 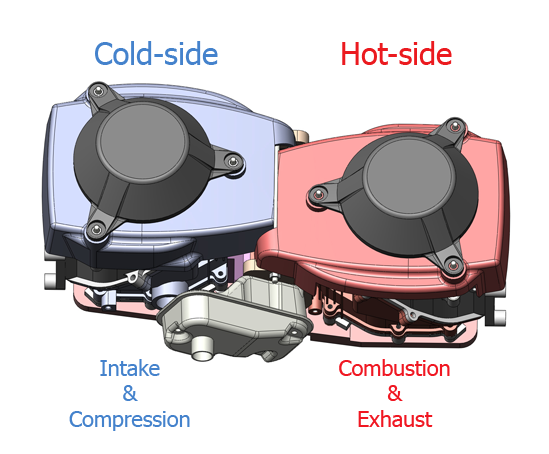 One half handled the cold process (intake and compression) while the other half handled the hot process (combustion and exhaust). And so, Tour’s Split Cycle Engine was born. More advanced prototypes and state-of-the-art computer simulations were developed in the months and years that followed. Outside, independent experts predicted that Tour ‘s patented engine design – with its focus on “thermal optimization” – could be up to 45% more efficient than today’s best ICEs. Fast-forward to now, Tour Engine Inc. (TEI) is a thriving research and development company diligently focused on perfecting – and soon commercializing – efficient, simple and green internal combustion engines for use in transportation, industry and electrical generation. Tour's business opportunity - and potential impact on society - is enormous. Because ICEs, and the fossil fuels they burn will remain a fixture of modern life for many years to come; and, because current ICEs fail to convert about 70% of the fuel's energy into useful work, Tour can deliver invaluable economic and environmental upside. Tour Engines stand to dramatically lower both fuel consumption and noxious emissions. Tour is backed by sophisticated technology investors and has won grants from both the US (DOE's ARPA-E) and Israeli (DOE) governments. Tour has also been issued 16 patents (US and International) with several more pending. Interested in partnering with Tour Engine or joining our world-class team of engineers and scientists? Please contact us.